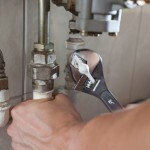 Dripping Faucet, FishHawk, FL | A Step Above Plumbing Inc. Dripping Faucet, FishHawk, FL | A Step Above Plumbing Inc.
We have experienced plumbing technicians who can diagnose and repair a dripping faucet in FishHawk, FL quickly and efficiently. Between your bathrooms, kitchen, and laundry area, you probably have quite a few sinks in your home with faucets that have the potential to leak. There are a number of reasons why a faucet might start dripping, and even a small drip can cause an increase in your water bill by as much as 10% per month. In addition to the extra cost, a dripping faucet can also waste as much as 10,000 gallons of water per year. You might have a faulty O ring or a washer that needs to be replaced, or it could be something bigger that will require an in-depth inspection. At A Step Above Plumbing, we have experienced plumbing technicians who can diagnose and repair a dripping faucet quickly and efficiently. If you do have a dripping faucet in your FishHawk, FL home, you can start by trying some simple repairs on your own. Sometimes just tightening a washer or replacing a seal within the faucet can fix the issue. When you fix a leak, you can feel confident that you are saving money and water each day. Be sure to shut off the water before you start, or you could have an even bigger problem on your hands. If you are unable to fix the dripping faucet yourself, we are happy to help. We offer extended hours on Monday through Friday, so we can accommodate your needs, and we also have weekend appointments available. With more than a decade in business, our owners take pride in providing excellent service to each client who contacts us for a plumbing service.